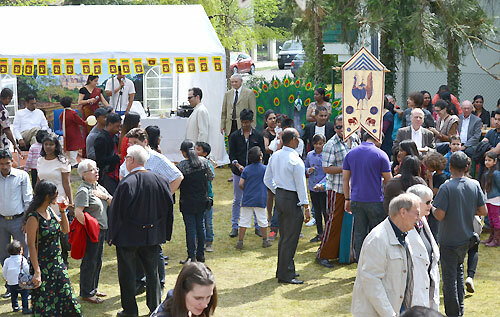 Sri Lankans domiciled in Berlin, Germany, celebrated the Sinhala & Tamil New Year organized by the Embassy of Sri Lanka in Germany. The event consisted of New Year rituals and games and was held at the Embassy premises on Saturday the 25th April. The theme this year was; "Peace and Reconciliation". Ambassador Amunugama inaugurated the event by hoisting the National flag followed by the singing of the National anthem by all present. Representatives of six Sri Lankan associations based in Berlin joined the Ambassador in Lighting the traditional oil lamp. Then the traditional boiling of milk in a new clay pot on a wood fire (Kiri Ithiraveema) was done at an auspicious time. Religious observances were conducted by the Buddhist and Hindu clergy and blessings were invoked on the people gathered. Welcoming the visitors, in his opening speech Ambassador Karunatilaka Amunugama highlighted the cultural and social significance of the Sinhala &Tamil New Year and the importance of continuing this cross cultural event for unity among communities. “This celebration clearly demonstrates the deep-rooted common bond and cultural heritage between Singhalese and Tamils in Sri Lanka. Let us all continue to uphold and cherish that common bond and heritage among us and wish that all our people in Sri Lanka will live in peace and harmony as one family, the Sri Lankan family,” he said. The Embassy had also organized games which are particylar to the New Year season in Sri Lanka which included, drawing the eye of the elephant, while blind folded, sack race, fancy dress parade, passing water balloons, walking with a lime on a spoon, passing eggs, needle & thread game, musical cap passing, hitting a hanging pot while blind folded (kanamuttiya gaseema), Collecting Toffees,Tug of war (kamba edema), finding the ”Hidden Guest" and many more. Around 300 visitors, among them more than 40 children enjoyed a full day of New Year celebrations. All who attended the event were treated to a traditional New Year breakfast consisting of milk rice (Kiribath) and traditional New Year Sweets Meats like Munkewum, Kokis, Welithalapa, Wibara etc., as well as pure Ceylon tea. A delicious traditional Sri Lankan lunch buffet was also laid out to all the visitors. Traditional Sri Lankan Music unique to the season was played throughout the event. The day ended with a prize giving ceremony, awarding three prizes for each game. In his thanking remarks, Ambassador Karunatilake Amunugama appreciated the support given by the six associations in Berlin, the Eksath Sri Lanka Kavaya, Sri Lanka Association Berlin e.V., Berlin Lions Cricket Team, DesPa e.V., Sinhala Cultural Association e.V. and Lanka Help e.V. Deutschland and the Sri Lankans living in Berlin. He pointed out the importance of teaching Sri Lankan cultural and traditional practices to the younger generations growing up in foreign countries, . The event concluded after singing the National Anthem. The first effort of holding a New Year celebration by the Sri Lankan Embassy goes back to 2010, by the then deputy Ambassador Maj. Gen. Jagath Dias. This first endeavour was a unique event, as the war veteran sacrificed his entire monthly salary in order to make the event a success that year. This followed a very successful New Year Celebration in 2011. Since then Berliners had to wait for three years as there was no New Year Celebration organised by the Embassy during Ambassador Kongahage's tenure. However, Ambassador Amunugama has correctly and appropriately identified the importance of cooperating and getting the support of the Berlin based Sri Lankans, in promoting Sri Lanka in Germany.